Note: This post is from our book Develop Great Images in Lightroom (available on iBookstore & Scribd). A crooked photo can be downright distracting (unless you really wanted it that way of course). Fortunately Lightroom makes it easy to fix an unbalanced ball head. But what happens if you need to rotate the image or even flip it? Not a problem these are all easy fixes. 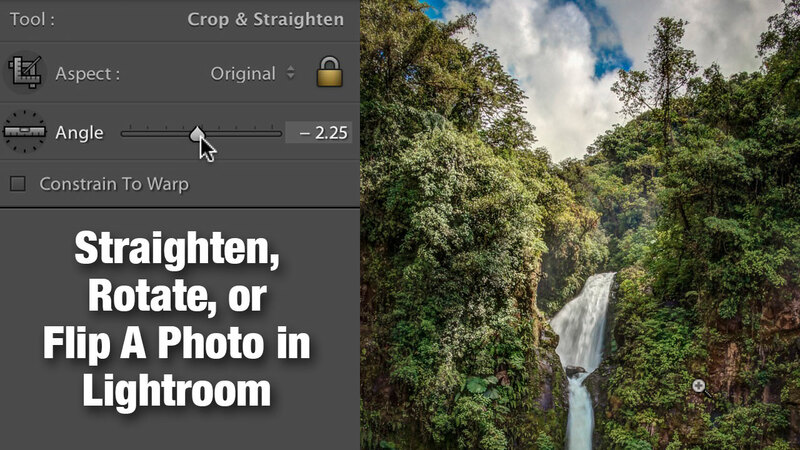 There are three ways to easily straighten a photo when using the Crop Overlay tool. Move the pointer to just outside a corner crop handle. The cursor will switch to the Rotate icon. You can now drag to freely rotate the image (up to 45? either way). Drag the Angle slider to rotate the photo. hold down the Option or Alt key to get a grid to help when dragging. While your camera can usually flag images properly for portrait and landscape, sometimes the motion in your camera fails. Othertimes you might be shooting into a mirror or reflection and want to flip the image. To rotate the image 90?, choose Photo > Rotate Left (CCW) or Photo > Rotate Right (CW). You can also use the equivalent shortcuts of Command+[ (Ctrl+[) for counterclockwise and Command+] (Ctrl+]) for clockwise. To flip the photo horizontally, choose choose Photo > Flip Horizontal. This will make a mirror image of the photo. Why don’t the Flip and Rotate commands appear in the History panel? They are undoable with the Ctrl+Z command.